Chin surgery, or genioplasty, is the technique of altering your chin to achieve the desired aesthetic result. Changing the position or projection of the chin by correcting the underlying bony framework can improve the appearance of the chin and the face overall. 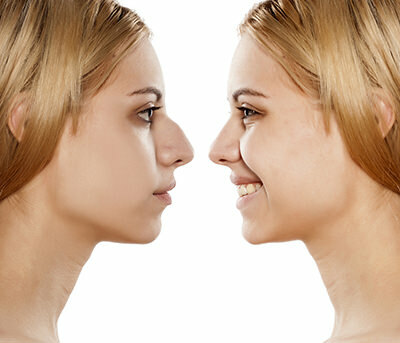 The position and shape of the chin is traditionally perceived and surgically changed when the chin is small or recessed. This makes the face overall appear smaller with the neck looking short and full, the jaw line ill defined, and the nose may even seem large. Changing the position of the chin (i.e., bringing it forward) has one of the most dramatic effects of all of the facial procedures. Osseous genioplasty is frequently performed for two reasons: (a) versatility; chin can be moved in any direction— sagittally, vertically, or transversely; and (b) a receding chin or small mandible, or both, are common problems among white North Americans, occurring in approximately 5% of the population. When these factors are coupled with the emphasis that Western culture places on aesthetics and the belief that a well-defined jaw line characterizes an aggressive, self-confident individual, it is little wonder that this operation has grown in popularity. The ready availability of alloplastic material such as silastic, however, has prevented osseous genioplasty from becoming an operation that large numbers of plastic surgeons currently employ. The choice between alloplastic augmentation (chin implants) and osseous genioplasty for correction of the weak chin remains hotly debated among plastic surgeons. The proponents of alloplastic augmentation cite the technical ease, the relatively low risk of complications, and the ability to perform the procedure under a local anesthetic. Those who favor osseous genioplasty point out the extreme versatility of an osteotomy in correcting three-dimensional deformity. Genioplasty can be performed through either an intraoral or a submental incision. In general, an intraoral incision is preferred for an osteotomy unless only a reduction genioplasty is being performed with a bone-shaving technique. Most implants can be placed through a submental incision. This incision will minimize the chance of cephalad relocation of the implant, contamination with organisms present in the oral cavity, and lip ptosis. In an effort to select the correct procedure, one should simply ask which procedure will provide the best correction for the particular patient. Certain factors are indisputable: (1) Chin implants can adequately correct mild to moderate volume deficiencies of the mandible at the level of the chin in the sagittal dimension (2). Chin implants cannot correct vertical excess of the anterior mandible (3). Chin implants are unreliable in correcting asymmetries of the anterior mandible in any plane of space. On the other hand, chin implants are ideal for patients who have a mild to moderate sagittal deficiency of the chin accompanied by a shallow labiomental fold. Thus, the type of implant selected will depend on the magnitude of the deficiency. It can be small, medium, or large. There is also a chin implant that can extend beyond the chin territory over the mandibular body. On rare occasions, it is necessary to use a combination of chin implants and mandibular body augmentation. A genioplasty represents the most versatile procedure that the plastic surgeon has available to enhance the balance and proportion of the lower face. It is a powerful tool that can yield dramatic results.